Some people appear natural at public speaking – poised and confident even though they frequently admit to being nervous beforehand. Then there are the rest of us, who shake, shy away and stammer at the mere thought of speaking in front of an audience. Interestingly, more women than men admit to a fear of public speaking, and for some surprising reasons. For example, women tend to shoulder an inherent fear of not having something of value that an audience would want to hear. Furthermore, many women prefer not to be in the spotlight. By and large, public speaking is an acquired skill, and there are ways you can get better at it. One of the most effective is to prepare as much as possible; know your topic inside and out. Review the points you want to make over and over again until you can recite them in your sleep. Even while holding notecards to prompt your speech, your mind can still go blank (and watching your hands shake, knowing others can see it as well, does not exactly help). 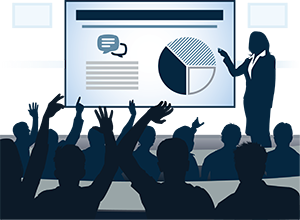 The better you know your topic, the more knowledge you have to fall back on if you need to transition to a question-and-answer session just to get through the presentation. 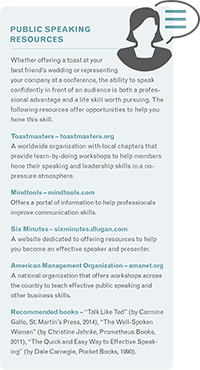 The following are some additional tips to help anyone – women and men – thrive at public speaking. Develop a signature style – both in appearance and presentation. Think of Steve Jobs, who wore a black turtleneck and projected a single graphic behind him as he spoke to reiterate his points – in lieu of words the audience must read. Focus on your message – instead of thinking about what you want to say, consider what information the audience wants to hear. If you impart useable information, people will care more about the content and less about the delivery. Move around – try not to hold the podium in a death grip. Use hand gestures and walk around – this movement will help you loosen up and be more fluid (less robotic) in your speech. Work the room before the meeting gets under way – greet people who come in, introduce yourself to some you don’t know and connect with those you do. This will help you establish eye contact with friendly faces as you speak, which will give you more confidence. Breathe deeply – in through the nose, hold it for a count or two, and exhale through the mouth to help your voice stay relaxed. Practice makes perfect – even the best speakers practice their speeches over and over again – that’s what makes them good speakers. Some of the same principles apply when it comes to speaking up in meetings, too. Of course, these guidelines don’t just apply to women; men can use them to improve their public-speaking skills. However, it seems the world still needs more of the female perspective in positions of power. We need more women in the highest levels of politics, in the C-suite offices of America’s corporations, starting their own businesses and supporting other women. And in today’s society, exposure gets you noticed and promoted, and being able to speak often and well gets you that attention. The more you speak publicly, the better you’ll become at it. But whether you become an accomplished speaker or not, know this: Speaking is something you do; it does not define who you are or what you know. The more you believe in yourself, the more your confidence will show and your abilities will be recognized.